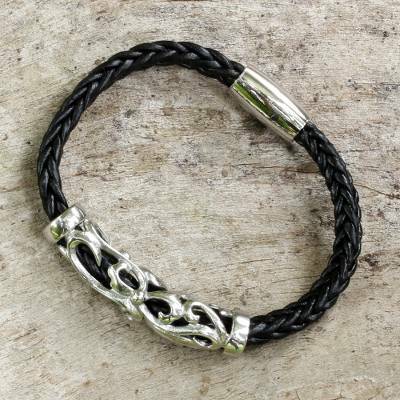 Black Leather Braided Wristband Bracelet from Thailand, "Simple Enjoyment"
Thai artisan Passarmon braids together black leather cords to create this striking wristband bracelet. On the front of the bracelet, the artisan crafts a swirling design out of stainless steel to form a pendant. You can find leather wristband bracelet 'Simple Enjoyment' by Passaramon in jewelry categories such as No Stone Bracelets, Stainless Steel Bracelets, Leather Bracelets, Braided Bracelets and Wristband Bracelets. Enjoy exploring these sections for other Novica treasures. The Quality is great and I love the design, the only thing is that if you have a larger wrist like I do then you might want to look at something else, so my wife really loves this bracelet. I rec'd my bracelet yesterday and put it on right out of the package. The detail is beautiful and the clasp makes it so easy to put on. I will wear this daily! This item is a great value. It looks exactly like the picture. I had a need to replace a John Hardy bracelet quickly and didn't want to spend hundreds of dollars. This is a great value. "This is the first time I've been able to show my work to the world. I hope you like it!" "One of four children, I was born in Bangkok on October 6, 1975. I majored in political science. "After graduating, I helped my parents in our family business, which was selling electrical equipment. There was not much challenge because it was already well-organized. I wanted to try something related to crafts because could use my creativity. In 2000, I decided to move to Chiang Mai and stay with a friend of mine to find my inspiration, because Chiang Mai is a city of art and is well-known for its many handicrafts. Unlike in Bangkok, the Chiang Mai lifestyle is unhurried. So I thought I would be able to set up a small workshop here. "I began by crafting fabric boxes in a number of patterns and I took custom orders. I also made notebooks covered with fabric and placed them in shops on consignment. Later, I began to use leather in my designs. "I personally like leather because it has its own charm. It has life and has been developed in many diverse styles. The more you use it, the more beautiful and durable it becomes. "However, one of the challenges of leatherwork involves areas with imperfections that I have to cut it off. I began to craft smaller pieces, such as small bags, cell phone cases and jewelry. "To make a bracelet, I start with a strip of leather and often incorporate metals as a complement. My goal is to create designs that are simple yet outstanding to be worn by men and women on many occasions. For my women's designs, I take the idea of men's strong character but I make women's bracelets smaller and add braided details that are feminine and beautiful. "Quality is important to me and I feel proud when shoppers come back to buy more of my designs. Some buy them because they want to give a good quality gift to someone they love. This encourages me to create more designs.